For the background paper I used two different My Mind's Eye dp from the Laundry collection, which I sewed together. Ich habe meinen neuen Fiskars lace border punch verwendet. Das Hintergrundpapier besteht aus zwei verschiedenen My Mind's Eye Papieren, die ich mir der Nähmaschine zusammengenäht habe. The sentiment is from the "Fairy Useful Sayings" collection designed by myself, which is currently on sale at the Whiff of Joy online shop. Der Text (Manchmal werden Märchen wahr) stammt von dem "Fairy Useful Sayings" Set, das ich selbst designed habe und ist momentan im Angebot bei Whiff of Joy. Ich hoffe ihr habt Zeit an der challenge teilzunehmen. Wir haben diese Woche eine tolle Gast Designerin. Donna hat sich eine tolle Karte nach dem Sketch einfallen lassen. Kanon Nydelig skisse, jeg har allerede prøvd meg, men kommer defentlig til å lage flere kort med skissa di!!! 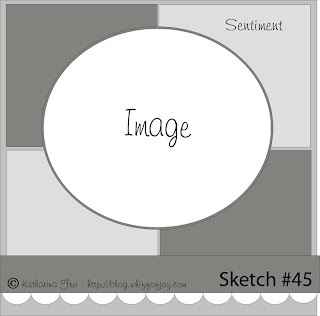 WOW...Katharina, I adore your sketch and your card is STUNNING!!!! Adorable! I could not love WOJ stamps any more than I do. Gorgeous!! Love that stamp, she's beautiful and I love the dress she's wearing. Love your card Katarina, teasing us with more stamps. love your coloring too, and thanks for the great sketch this week. I had fun following it. 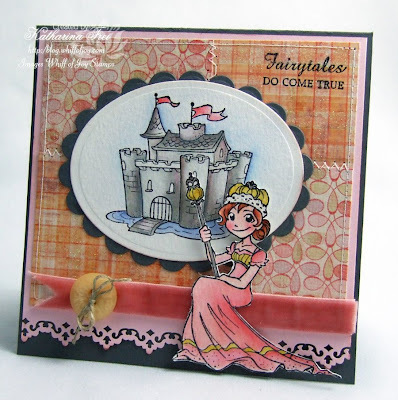 Wow Katharina such a gorgeous sketch and such a stunning card! 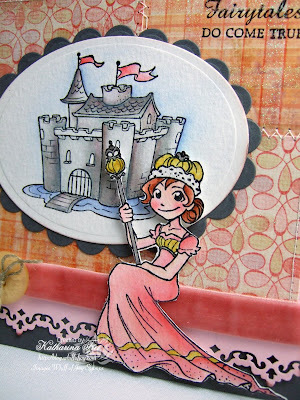 Wow, love how she is sitting on the ribbon... and the castle in the background is colored to perfection..
Wow... the card is absolutely stunning!!! The sketch was LOTS of fun this week. Wishing you & your family a Happy Easter! This is a wonderful card! I lvoe that little queen! Gorgeous card! She is so beautiful! I can't wait to see the others. I am on vacation this week so hopefully I can play along with the sketch when I get back...looks like a fun one! uhi, das sieht vielversprechend aus! Klasse Motive! What a sweet card Katharina, sweet stamp and beautiful colors. Fanastic sketch such fun to do!!! Thanks for the inspiration, your card is amazing, must get my hands on your senitment in the near future! Beautiful card - great sketch too!